The Delta Bar® System combines the benefits of an aerodynamic profile shape to minimise wind noise and significantly reduce fuel consumption whilst retaining the virtues of strength using light yet strong high-tensile steel. Delta Bar® has been crash tested to 20g and is TUV certified. The Modular Rack Range offers a quality heavy duty roof system for the transportation of loads, finished with Electropaint primer and polyester black powder coating to ensure the maximum corrosion resistance. Certified TUV approved and crash tested to 20g the modular racks are available in 2, 3 or 4 sections (depending on vehicle size). The Rhino SafeClamp® incorporates strength, speed and style to provide a revolutionary ladder clamping system. Use of a composite beam structure and stainless steel anchor hook offershigh strength, whilst providing excellent corrosion resistance. The innovative one touch clamping method ensures that the operation is five times quicker than traditional screw down ladder clamps. The Pipe Tube incorporates strength, style and security to provide the best method of transporting copper pipe, conduit or similarly lengthy materials. Innovative design and high specification materials have ensured the Pipe Tube has passed rigorous testing processes. The Rear Roller System attaches onto the rear Delta Bar® and provides an easy way to load and unload onto the bar whilst protecting the rear of the vehicle. 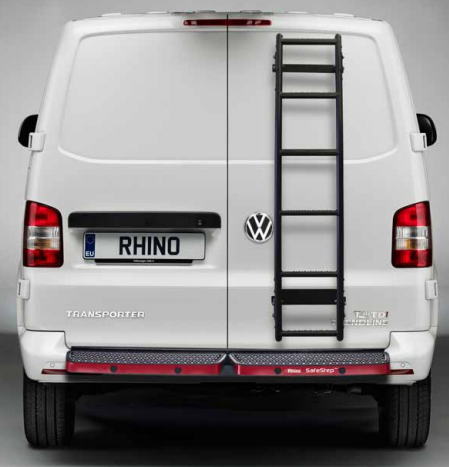 The Rear Door Ladder has been designed to blend aesthetically with the van styling and has user-friendly round hand rails and anti-slip plates to enhance safety. Rhino Products are Europe’s leading manufacturers and suppliers of roof racks, bars and accessories for the commercial vehicle market. With over 15 years’ experience in manufacturing and producing commercial vehicle accessories, Rhino can confidently claim to deliver exactly what the end user is looking for to make their job easier. View the Rhino Product catalogue below.